A traditional classic lunch time offer, with the added benefit of being gluten free. 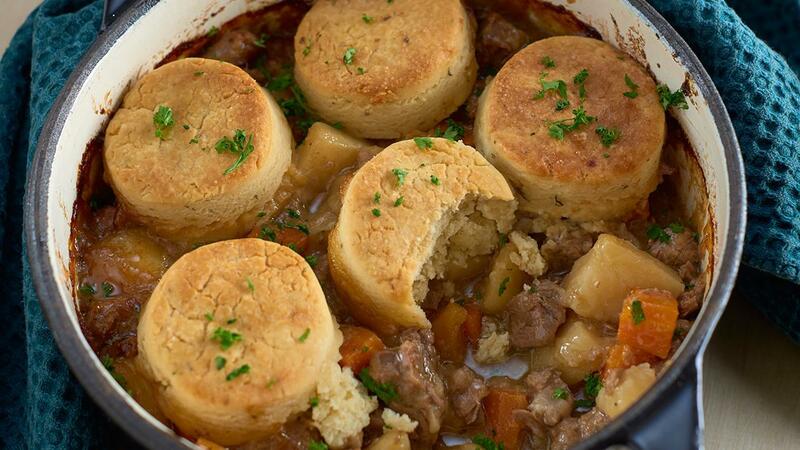 Try adding some horseradish to the cobbler to accompany the Beef. Make the KNORR Beef Bouillon by adding the paste and the KNORR gravy granules to boiling water. Cut the beef chuck into 15mm cubes. In a suitable casserole pan colour the beef and onions, add the KNORR Professional Garlic Puree and cook for a further 2 minutes. remove from the pan and set aside. Place all vegetables into the pan and sweat for a further 10 minutes stirring occasionally. Return the meat to the pan and combine all ingredients together. Deglaze the pan with the bouillon and bring to a gentle simmer. Cover the pan with a lid and place into a preheated oven at 150c and cook for approximately 1.5 hours or until the meat is tender. Remove the Casserole from the oven and remove the lid. Transfer the casserole to a large gastronom tray and keep warm. Sift the gluten free flour and gluten free baking powder into a large bowl. Add theFLORA Butteryto the flour mix and rub together until it resembles fine bread crumbs. Mix in the KNORR Professional Mixed Herbs Puree, parmesan and low fat yoghurt. Mix until a dough is formed. On a floured surface roll out the dough and cut into discs approximately 5cm wide and 1cm thick. Place the discs on top of the casserole, and brush with a beaten egg. Increase the heat in the oven to 180c. Return the casserole to the oven and cook for a further 25-30 min till the cobbler is golden brown. Mix all the flours together thoroughly or place into a food precessor and pulse until mixed.